Eggs Rio Grande is one of our favorite Hatch green chili recipes! This Mexican breakfast idea has a line-up of ingredients that will wow the palate. 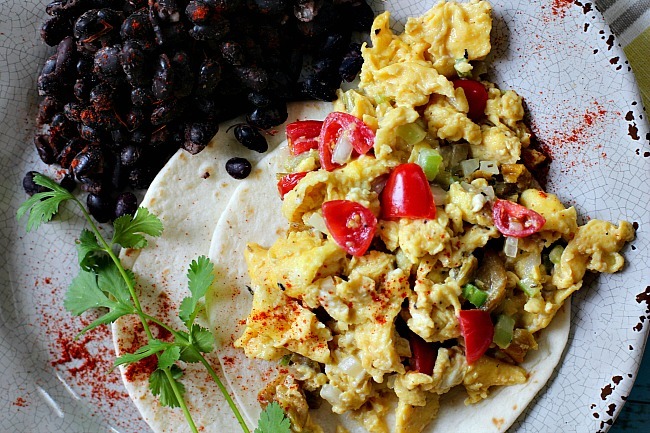 An easy Southwestern scrambled egg recipe to feed your next hungry breakfast or brunch crowd. What are Eggs Rio Grande? This quick breakfast dish is made ala Southwestern with red cherry tomatoes, sweet onions, Hatch chile peppers, celery and seasoned with vinegar, sugar and rosemary. Yes, vinegar and sugar. If you would have said to me, “add sugar and vinegar to your scrambled eggs next time you make them” I would have looked at you like you had two heads. This recipe from the Albuquerque Junior League, Simply Simpatico Cookbook, asks us to do just that, and what a delicious surprise it is. For your convenience, I’ve included an Amazon Affiliate Link for the cookbook if you’re interested in ordering. It’s so good, that I’ve not only also served this for breakfast but have made it again for a quick, easy dinner. Served over warm flour tortillas and a side of black beans, it’s a great way to celebrate the flavors we love so much for an easy Mexican breakfast. We don’t have garden fresh tomatoes yet, but cherry tomatoes, simply halved, then quartered worked beautifully in this dish. And with beautiful sweet Vidalia Onions in our markets now, you must try this recipe before those onions are gone. This is very well balanced dish in flavor and in creamy texture. The onions and the peppers always make a great pair, and bringing in the celery, vinegar and sugar makes this an exciting experience. What we love about this recipe is that the chopped vegetables aren’t cooked with the eggs, but added at the end. Just long enough for them to warm and blend flavor into the eggs. Which brings a bit of a nice crunch to the dish. And why it’s important to practice your chopping skills and dice those onions and celery into small or medium dice, 1/4 – 1/2 inch square. I’m of the opinion that scrambled eggs are very often over cooked resulting in a dry and rubbery texture. It’s the most common mistake in cooking the eggs. Scrambled eggs should be light, silky and with delicate curds. Every morning at Culinary School we made breakfast for 25. One of our preferred ways to cook scrambled eggs was to simply season with Fines Herbs, (a classic French herb seasoning mix of fresh parsley, chives, chervil, and tarragon). So yes, we got plenty of practice at scrambling eggs. Here are some things I learned to help achieve the perfect scrambles eggs. Thoroughly blend your eggs with a whisk. Blend, don’t beat, until a uniform mixture is evident. You don’t want them frothy. Gentle heat. Cook the eggs over medium-low heat and pay attention all the time to keep from cooking the eggs too quickly or too much. Add butter to the warmed skillet. Let the butter come to a slight bubble and when the bubbles are gone, add the eggs. With a rubber spatula stir often and gently at first so the cool eggs adjust to the pan. When the first curds appear, stir intermittently, and lift and fold the curds onto the fluid egg. Continue to fold and stir until you see steam rising and the whole mixture is beginning to set. Remove from heat while they still look “wet”. Looking for more Southwest Breakfast Ideas? I hope you give this scrambled egg recipe a try. And if you do, please come back and let me know how you liked it and give the recipe a star rating. Your feedback is valuable to me for developing future recipes. And if you have a favorite Mexican breakfast recipe, let me know, I’d love to give it a try. 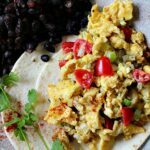 And if you’re loving the idea of scrambled eggs with that South of the Border flair, you won’t want to miss this easy recipe for Mexican Scrambled Eggs. This is a recipe for Eggs Rio Grande, a Mexican breakfast idea with a line-up of ingredients that will wow the palate. 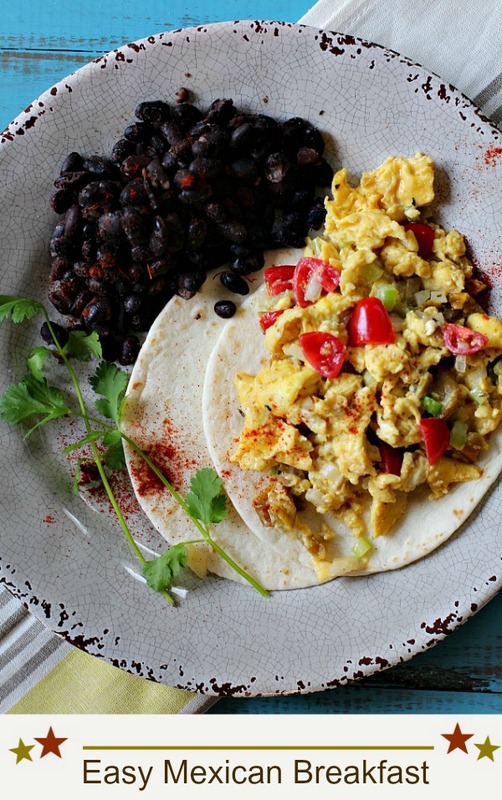 An easy Southwestern scrambled egg recipe to feed your next hungry breakfast or brunch crowd. Mix tomato, celery, onion, green chiles, sugar, vinegar and rosemary and let blend while preparing the eggs. In a bowl the eggs, milk and salt and pepper. Blend gently with a whisk. Heat a skillet over medium-low heat. Add the butter until it bubbles. When the bubbles start to subside, Add the eggs. Using a spatula, gently move the eggs around the pan until they are still shiny and moist looking. Don't let them over cook or they'll dry out. Add the tomato mixture just before the eggs are set. Stir to let the mixture combine and the vegetables to warm. Remove from heat. Meanwhile, warm the flour tortillas in the microwave or a 300 degree oven. Pile the hot eggs on the warmed tortillas. Finish by sprinkling some New Mexico Red Chile Powder over the eggs and tortillas. Serve with a chile salsa if desired. I’m linking this recipe to Meal Plan Monday. Looks delicious LA and your egg cooking instructions are just the way my grandma taught me to cook them oh so many years ago but I would have a tough time adding the sugar as I rarely add it to anything. Lea Ann, that looks delicious! Wish I’d had that for breakfast this morning instead of a spoonful of peanut butter! I love this idea. Mexican flavors for breakfast is the only way to go in my opinion. What a hearty brunch! Love the celery, rosemary, and chile powder! Hearty breakfast. I could eat this for lunch. What a fantastic breakfast! I sure hope this magically appears for me tomorrow morning! !